Or get each guest as a separate file. With too many questions I can’t answer, I called up a lifeline. Micheal Mielke calls himself a “Cultural Transformation Engineer”. Earlier in his career, Michael led a movement to get tens of thousands of kids moved from state care to real families. He was the Executive Director for a movement that became the Coastal Wetlands Planning, Protection and Restoration Act for Louisiana and the Gulf Coast, passed by Congress. Now Michael Mielke has teamed up with visual artist and Post Carbon Salt Lake founder Jean Arnold. They are on a quest to get billions of dollars invested for the great emergency of our time: climate change. Their organization is called the Association for the Tree of Life, or ATL, based in the great state of Utah. In May 2018 Michael and the Association for the Tree of Life released a new ebook titled “Climate and Ecological Delusions and Contradictions That Will Rapidly End Humanity…Unless…” It is free to anyone online. The MAHB site at Stanford immediately published a shorter summary piece, and Resilience.org picked it up too. The new online book “Dragons and Delusions” says: “In a World Full of Delusions, What Does an Individual Who Sees Them Do? The ATL is careful to point out it’s not just climate change that threatens us. Plastic particles are becoming more common in the ocean than sea life. It would be strange to start winning on greenhouse gas emissions, only to find that life is dying from plastic pollution and the general extinction of biodiversity. Are there too many heads to this dragon? The new online book come up with a source of money and power that could help us. Governments are not moving fast enough to save the climate, or in the cases of the United States, Canada, and Australia, are going backwards, working to make the climate emergency worse. Even local governments can’t do it. Obviously, major corporations and the banking world care more about short-term profits than long term survival. We need someone with billions and billions of dollars who could care – but who? Mielke and ATL say the big foundations must step in. The Bill and Melinda Gates foundation have and spend billions to help humans, so far mostly with health. But what good will it do to save lives with vaccinations – if those same lives starve in drought due to climate change? Multi-billionaire Warren Buffett has also contributed some of his billions to that same foundation. Other foundations like Hewlett and MacArthur have helped many causes too, but so far, no one has stepped in to fund the first big phase: warning the public – daily! – of the grave dangers of climate change – and then preparing them for the massive changes we have to make to our society to get out of this alive. It’s not just about putting solar panels on the roof. As Michael and the ATL explain in their online booklet, we need to change out our whole energy system, our toxic food production system, our consumer culture (!!!) and our expectations of what each of us can take from the Earth. We are talking about social and cultural changes heading into a new sustainable civilization. Nothing less will do. Billions and billions of dollars were made in the oil industry. It seems second generation oil money will not support environmental causes that question oil dominance. But the Rockefeller Foundation, drawing from the original magnate of the American oil industry, the younger Rockefellers are withdrawing completely from fossil fuels. That is a good start. There are hundreds of billions of dollars, pounds, and Euros given out each year by philanthropic foundations. Suppose, just to start in 2019, ATL manages to steer a measly one billion dollars worth to groups trying to organize a massive climate campaign. That isn’t quite enough to buy a Congress or Parliament – but that initial burst could be powerful. Let’s see if we can replace gas-burning car advertising with programs to promote climate action. There is a short video with the booklet. Check that out here. The speakers are Katharine Hayhoe, the Evangelical Christian climate scientist who is speaking out, and the Reverend Michael Dowd, calls himself a “pro-future Evangelist”. I ask Michael about why choose conservative supporters of religion, and he says that organized religion can really help, and should be part of the social changes we seek. At least most religions have the idea of “help” built into them (unlike corporations). This ebook does propose a way forward, with some action suggestions. But they are also very honest about the many we ways we have already failed. I share that sense of failure. Despite 12 years of broadcasting serious climate warnings, direct from scientists who have the facts, humans added more greenhouse gas pollution to the atmosphere in 2017, not less. American politicians currently in control of the federal government say they do not have the public support to morph away from this wonderful time of fossil fuels. Polls say otherwise, but it’s true the public continues to vote with their money, buying more and more gas-powered gizmos. We are addicts with no rehab. I think we will need fossil-consumer rehab centers as part of the plan. In 1942, the Fascists controlled all Europe, parts of Africa, the Middle East, China, and all down to the Philippines. There was no guarantee of victory. If a person died in 1942, they may have left this world thinking that evil was going to triumph. Frankly, with this long climate battle that will take decades, it’s possible Michael and I could pass on without knowing how this story ends. But Michael objects! He tells us we’ll be lucky if we have ten years to make the big change, before a climate shift knocks out a lot of our decision making. After that, the world just keeps on warming for centuries, for thousands of years. So we better see the big cultural change soon. Michael Mielke is President of the Board of the Association for the Tree of Life, Jean Arnold is Vice-President. 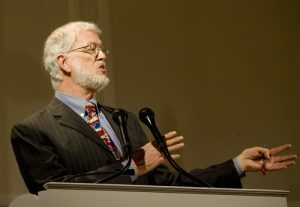 Lawrence Wollersheim, author of “Climageddon: The Global Warming Emergency & How To Survive It” is also a Board member. You can go directly to the web site www.tree-of-life.works. Maybe it won’t be the heat of global warming that undoes us. In the worst case scenario for this century, new science from NASA suggests it could be how much water is available. Hard data from satellites show big changes have already occurred. And finally we have enough detail to peer into the future where you live. 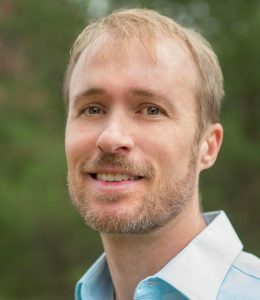 We are fortunate to have on the line the lead author of the new paper “Emerging trends in global freshwater availability” Dr. Matthew Rodell. Matthew is Chief of the Hydrological Sciences Laboratory at NASA Goddard Space Flight Center in Greenbelt, Maryland. He’s an author in over 100 papers in major scientific journals, editor of a journal on Hydrometeorology, and a member of the science team for NASA’s Gravity Recovery and Climate Experiment, called GRACE. Ninety nine percent of my listeners just turn on a tap, and there’s the water. But the majority of the world’s people don’t have those magic taps and water rights. World water stress is very high right now, with over half of humans without ready access to clean drinking water. That is going to get worse, according to the new climate predictions in this study. The new paper comes with a fabulous color map where we can look at the hidden water wealth of the world. 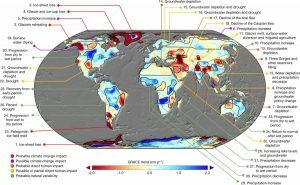 The paper “Emerging trends in global freshwater availability” is free to anyone, as published in the Journal Nature, May 16, 2018. Again, there have been articles warning China would experience big disturbances due to massive dam building, like the Three Gorges project. But maybe climate-driven changes may help the Chinese people get past that. The paper explains why. For one thing, in extreme climate change, precipitation to the Tibetan Plateau is projected to increase by a staggering 20%, which could off-set most of the loss from glacial melt! We discuss India, where almost a billion people depend on the monsoons to water their crops. Now they are pumping out the groundwater, deeper and deeper. That changes the mass of the Indian sub-continent – and the GRACE satellites can “see” and measure that from space. The Middle East, this study predicts, will get even drier than today. Imagine even more troubles like Syria, where farmers were forced into cities during a drought lasting several years. But this paper suggests another factor: dam building in Turkey. Northeaster Brazil, Chile, and the Pacific Northwest (B.C. and Alaska) will lose water. The Middle East definitively dries up. The Himalayas are projected to get less water (terrible news for Indians living downstream), and Northeast China gets drier, as does part of the north coast of Australia. It even looks like Texas may get drier. Greenland loses lots of water, but we knew that, as glaciers melt into the sea. But we also need to consider the other side of the coin. Some parts of the world will necessarily receive MORE total water storage. They will become wetter. In very dry places in Africa, like Namibia, this may be a God-send helping to feed a growing population. But in the upper Mid-West of America, and the Canadian prairie provinces, increasing water may mean worse spring flooding and crop problems. Extra water storage expected along the Antarctic coast is less problematic – presumably this will be stored as snow and ice, although we never know. The study organized data from the GRACE satellite system in the period from 2002 to 2016. Then, with a lot of other resources, the team created projections of changes to available water supplies by the year 2080. They picked the worst case scenario from the Intergovernmental Panel on Climate Change, the 8.5 pathway (RPC) – because that highlighted the changes, making them easier to see. I would add: that is the path we are on anyway. Beyond agriculture and drinking, water is needed for energy. It’s not just hydro-electric dams that need water. Coal-fired plants and nuclear reactors need lots of water for cooling, and have to shut down when they don’t have it. It’s possible some existing dams and power plants will become less useful due to changes in hydrology. We’ve already had cases where coal plants and nuclear plants have had to shut down due to lack of water, including in France. In Australia, this paper says that after a phenomenal drought in Australia, where farming in the Murray-Darling Basin was almost given up, in the rebound, quote: “so much water stored on the continent in 2012 that the global mean sea level temporarily declined.” Sea levels around the world went down, despite rising seas? I find that hard to believe – but that is what happened for a short time. It was a joy to read this paper. It feels like we’ve been waiting a long time to move from global scale predictions to national and even regional news on changes to our water supply. The GRACE satellites are a miracle that can show us what is really under the ground for water. Where we had anecdotes and guesses, now we know. We know the Terrestrial Water Storage for the 14 year period studied, right down to specific regions and countries. That, combined with other studies and models, gives us some good guesses for the future. But again, the short time period of the study creates some uncertainty in projections. A longer term cycle or other factors could impose big changes. Plus we do not know what humans will do, to redirect rivers, dam them up, drain lakes, pump up the groundwater, or just create more evaporation due to farming. Humans may be the biggest unknown. By the way, brand new GRACE satellites, known as the GRACE “follow-on”, were just launched on May 22nd, 2018. This valuable project will continue. You can keep track of that here. Here are two good articles, in the Washington Post (may be a paywall for you) and at Phy.org (no paywall). If you enjoy this Radio Ecoshock show, or find my blog useful, please help support Radio Ecoshock. Your help really matters, keeping these climate warnings going out all over the world, free to anyone who will listen. Thank you for caring about our world. Katharine – It’s an honor you found this blog. I’ll correct the blog on both points. By the way, I’ve admired your work and your communication for years.